Have you or would you now consider creating and sharing any of your own materials as OER? Write an additional post sharing your own OER or reflecting on what OER you may/may not want to openly licence. This week’s things seem to be in my wheelhouse. 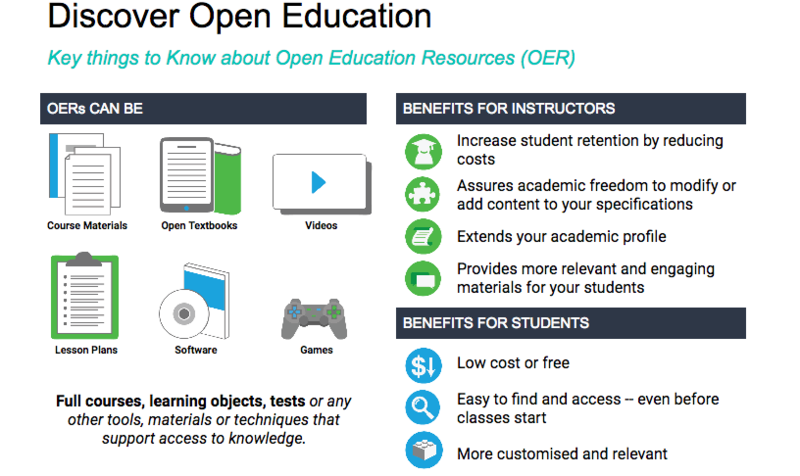 As I mentioned previously, I first started learning about CC and OER while in grad school. Following that I had an interest in it, and was able to use OER while developing learning materials for medical education. Later, while working as an instructional designer for continuing ed, I made use of figures and images that were CC licensed, even though I didn’t necessarily adapt them. I had a keen interest in creating OER, but given the contexts I was in, and that I seemed to be the only person who saw the immediate value in such things, the opportunities never really came up. That was until one summer I found myself with two great opportunities infront of me. The first was a job posting at Olds College in Alberta. They were looking for an instructional designer, and a curriculum developer, and I was looking for a change of scenery. In the first three minutes of the interview, the director of their CTL asked me, “what do you know about OER?”. This caught me completely off guard as there was no mention of it in the job posting at all. We chatted for a bit, and I discovered that they had funding to create an open curriculum for communications courses at the college. Originally I thought it might be supplemental to the ID work I was doing in continuing ed, but the amount of work and the timeframe meant it would be a full time gig. Even though I had a permanent full time position, I jumped at the opportunity. Working with SMEs, another curriculum developer, an editor, and an in house person we created the ProCom OER resources (a textbook, and ancillary resources). Later that same summer, Designers for Learning put out a call for volunteers to create a MOOC for the Instructional Design Service Course: Gain Experience for Good. I worked on a couple of modules with other IDs and our resources were all licensed CC. While I was an educational developer, many of my presentations/workshop materials were licensed CC as well and shared with participants. A number of those are available in my portfolio. Looking back through my portfolio I see some materials that are CC licensed and others that are not. In the future I hope to publish a bunch of photographs I’ve taken over the years on my own hosted site, but am currently undecided about how to license them. I see on the one side of the communities I am in that people would really encourage me to post things under a CC license. The claims that this is how open ed and the OER movement can continue to grow and gain traction. That contributing to the commons, specifically using the CC-BY license, is this kind of access pass you need in order to really be part of the community. But after discussions, thought, and reading blog posts or watching interviews of some educators I look up to (The Road to Sharing is Not Paved With Licenses; OER You Not Inspired? ), I wonder about those claims. For example, does this blog really need a CC license? Is it not truly enough that people can freely come here and read it without exchanging their information or paying? What is stopping them from writing responses, quoting me, like you would on Wikipedia or in a paper? Do they really need the ability to copy the whole work and edit it however they see fit without having to ask first? Even if they did have to ask (i.e. full copyright on this work), what’s stopping them from doing it anyway? Calling all #EdTech bloggers and blog readers: What are the best EdTech blog posts you’ve read floating around out there? In this open volume “EdTech in the Wild”, we’re collecting the best of the best to show that these ideas matter: https://t.co/V8xOyZMFAF Pls, nominate now! On that note, much of the work I produce now compared to when I was an ed developer, is more collaborative or supportive of others’ work. I help instructors create their own resources. Some is in closed environments and fully copyrighted. Others are open access. Others are fully CC. For some of the original work I produce myself, I consider the purpose and the audience before deciding which route to go. Some members of our community have decided that everything they create will be CC-BY and that works for them. For me, at least for now, I’ll consider on a case by case basis who I’m working with, the purpose of the materials, the audience, the delivery method, etc. before deciding which route to go.